Blue Ocean Leadership was created by world-renowned professors Chan Kim and Renée Mauborgne. The same way that blue ocean strategy can create uncontested market space, blue ocean leadership can unleash the ocean of untapped talent and employee potential in organizations. 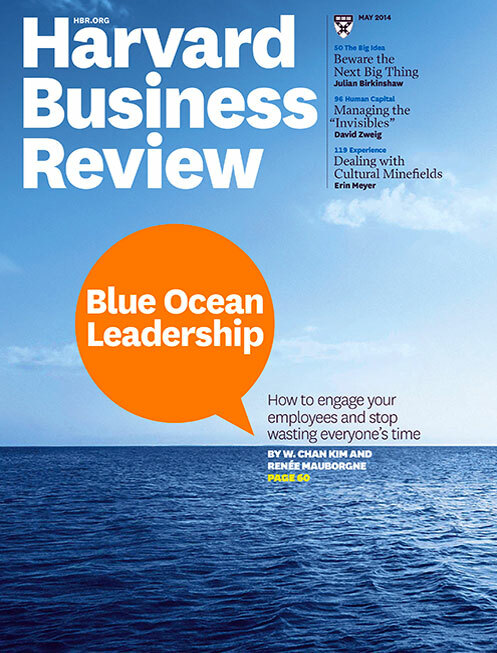 Unlike most research in the field of leadership that has largely drawn on psychology and cognitive science, blue ocean leadership developed by Kim and Mauborgne looks to the field of strategy to inform the practice of leadership in business. What is Blue Ocean Leadership? Blue Ocean Leadership provides a systematic way to unlock the ocean of unrealized talent and energy in your organization fast and at low cost. It achieves this while conserving leaders’ most precious resource: TIME. Blue Ocean Leadership in essence, can be thought of as a service that people in an organization either ‘BUY’ or ‘DON’T BUY’. Why you need Blue Ocean Leadership? How to put Blue Ocean Leadership into practice? 01 See your leadership reality. 03 Select to-be Leadership Profiles. 04 Institionalize new leadership pratices. A British Retail Group (BRG) applied Blue Ocean Leadership to redefine what effectiveness meant for frontline, midlevel and senior leaders.